There have been many war films, and even in the off chance that there are no more wars, the films will still continue. As many war films as there have been, the issue of soldiers during peace time is one which has not often been dealt with. 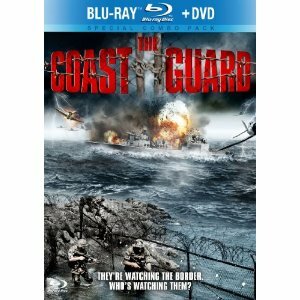 The Coast Guard, a dramatic tale from the director of 3-Iron, Samaritan Girl and Spring, Summer, fall, Winter…And Spring, deals with these issues in all brutal honesty. Director and writer Kim Ki-Duk has become an expert at bringing tales of harsh reality and somber tones to screen, and the Coast Guard is no exception. Along the Korean coast there are Coast Guard soldiers who patrol every night despite the fact that they are no longer in war. The guards hope that if any spies come on the beach, they will be there to kill them. It is driven into their training that killing a spy is among the highest honor, and because of this fact Private Kang waits eagerly for his chance to prove himself. In fact, Kang is far more eager than the rest, wearing camouflage make-up on patrol and sneaking through bushes on his free time. It comes as no surprise when Kang is the one to spot and kill a suspected spy on the beach. What is a surprise is the fact that the suspect is actually a civilian. Kang is rewarded just the same and although the girl who was with the victim went insane, Kang seems to be handling the stress calmly for a while. The more it builds, however, the more it seems inevitable that Kang is a danger to himself and others. There are no real comments on war within the film, but more about the idleness of a soldier without war, and perhaps the paranoia as well. The film is a character study of one soldier’s journey through the mad world he lives in. Kang is gung-ho until the accident and then he seems unable to lift a weapon, but this changes as well. By the end of the film we have a very harsh portrayal which is difficult to shake. As with other films from this director, the emotions of the characters are extreme and yet not always clear. The film focuses on them, so that the technical aspects of the film are not quite as good, but with the subject matter it would not work as well to be too polished anyways. The Blu-ray includes an interview with the director as well as a commentary track by him. There is also an introduction to the film by the director as well. It is clear that Kim Ki-Duk is very dedicated to his films, and is willing to spend the time explaining it to his audience as well. There is also promotional material, including a film trailer and a music video. These have all been released on the DVD before, however, the Blu-ray includes an exclusive making-of featurette and over 30 minutes of additional new features.